Pipette (sampling rod), available in three different lengths, GP 30, GP 60, and GP 84, to sample fuel tanks of over the road vehicles to provide a visual analysis of whether the fuel is clear (taxed) or red (untaxed). 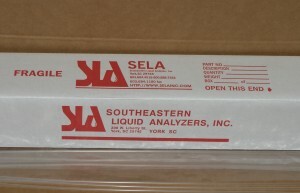 Pipettes are packaged 100 pieces per case. Vacuum pump, PV 20, is used to extract a small sample of fuel if a visual analysis of sample in pipette is not sufficient to make a determination, or if a sample needs to be sent to lab for analysis, or for a retain sample to show what fuel was taken from the tank. Vacuum pump connects with poly tubing (T-100 R or T-100S), and may be fitted onto pipette or inserted into tank. Sample bottles, glass or plastic with a 20 mm neck, are screwed onto bottom of vacuum pump to capture the sampled fuel. Bottles shown on Fuel Sample Bottle page. 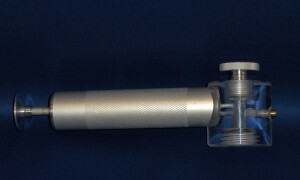 GP30: A 30” length, .165 diameter screening pipette (screening rod) made from polypropylene plastic for the detection of red dye in diesel, indicating the presence of non-highway taxed fuel. Each pipette is individually sleeved to ensure the integrity of taking samples with clean equipment. When using the pipette to see the true color of the sample, look at the meniscus, which is the drop of fuel at the top of the captured fuel sample. If you flick the pipette with your finger, it will cause a series of bubbles to form in the pipette and you will have meniscuses to visually analyze. The pipette is designed to take a quick fuel sample to determine if the fuel potentially contains red dye. It is used to quickly alert you to a questionable fuel sample. This is the Pipette length used for sampling truck saddle tanks. GP60: 60″ length pipettes made and sleeved exactly like the GP30, used for acquiring fuel samples of diesel powered pickup trucks. GP84: 84″ length pipettes made and sleeved exactly like the GP30, used for acquiring fuel samples of pickup trucks with an extremely long fuel neck. PV20: A vacuum pump for taking fuel samples, with a 20 mm opening to attach the 2 oz. bottle, and an opening to secure tubing for sampling. The pump is equipped with a vacuum release valve on the front of the pump to allow immediate vacuum release to prevent over filling of the bottle. T100R: Flexible ¼” polypropylene tubing, packaged in 100′ rolls, used in conjunction with the PV20 pump for acquiring fuel samples. T100S: Semi rigid ¼” polypropylene straight, 60” long. There are 20 pieces per sleeve, for a total of 100’. This is used in conjunction with the PV20 pump for acquiring fuel samples. 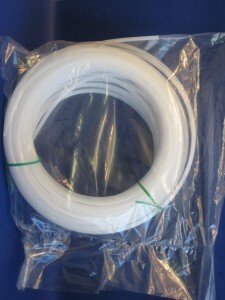 T100S-84: Semi rigid ¼” polypropylene straight, 84” long. There are 20 pieces per sleeve. This is used in conjunction with the PV20 pump for acquiring fuel samples from the top of a tanker truck.